Our trip planning tools show you the least crowded park to visit every day, customized touring plans for visiting Disney's best rides, honest restaurant reviews, how to save on Disney tickets, the best hotel rooms to ask for, and so much more. Subscribe: 1 Full Year for $15.95! Our Crowd Calendar shows how busy each Disney park will be for every day of your trip, using a simple 1-to-10 scale. You'll see the best park to visit every day. Create a custom, step-by-step itinerary to see your family’s favorite Disney rides without long lines. This is what we're famous for. See money-saving Disney ticket tips and where to buy your Disney tickets. Most families save $20 to $80 with our advice. Ride descriptions and ratings by age group. Candid dining reviews with current menus and prices. How to get the best rooms at each hotel. The #1-rated mobile app for Disney World on iTunes and Google Play. And more. We're so confident in our crowd predictions that we show yesterday's results - our predictions and what actually happened - in the How We Did section of the page for everyone to see. If you're trying to decide when to visit Walt Disney World, the crowd calendar will show you how busy Disney is across different weeks, months and seasons. Ready to see the best parks for every day of your Disney vacation? Don't lose 4 hours in line! Our touring plans are customizable step-by-step guides for seeing Disney World’s best attractions and minimizing your wait in line. These plans - and the amazing technology behind them - have been featured in the New York Times, Wired.com, Popular Science, USA Today, The San Francisco Chronicle, and many more news outlets. We even got a U.S. patent for the technology. Our touring plans will save you up to 4 hours in line versus families without a plan. 4 hours every day! Not sure how to use Disney's new FastPass+ ride reservation system? Our software will scan your custom touring plan and tell you exactly where to use FastPass+ to save the most time in line. When you're in the parks, you can follow your touring plan on your mobile phone. We'll even update your plan during the day if crowd conditions change. It's like having a GPS for Walt Disney World! Are you ready to drastically reduce your wait times at Walt Disney World? 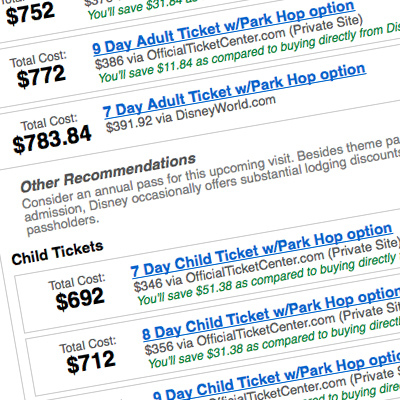 Disney World sells more than 160 different kinds of admission tickets. That makes it difficult to find the least expensive way to see everything you want. If you've got kids under age 10, you'll probably have about a dozen different ticket options to consider for your family. Trying to save money on Disney tickets? The good news is that there are Disney-authorized ticket wholesalers that sell Disney World tickets, some at a deep discount. The bad news is that you have to shop around. So that dozen ticket options that had to look at? It's probably closer to 80 now. Overwhelmed? Don't give up. Our Ticket Calculator will find you the best. Try it out - it's free! You'll be saving money in seconds. Want other money-saving tips? Save time in line? A $15.95 one-time payment gets you everything we've got. 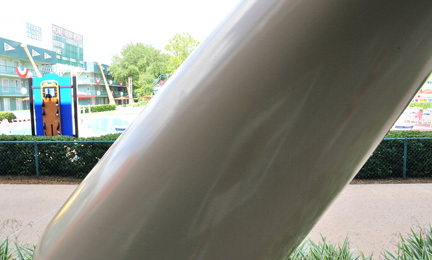 Are you ready to save on your Walt Disney World tickets and room rates? Along with these trip planning tools, we've got hundreds of pages of travel advice including detailed ride reviews and on-board video, candid dining reviews from a professional chef, up-to-date, searchable menus and prices from every Disney restaurant, and Lines, our smartphone app rated #1 for Disney World in both iTunes and Google Play. To help you decide, we’ve spent the past year taking pictures of what you’ll see from the window of every Disney World hotel room – more than 30,000 individual photos. And they're all available here. Why is choosing a room important? For one thing, you’re paying a premium to stay on-site. So consider these two photos, each of which is a room view you could get at random if you just let Disney make the decision for you. Don't leave your room view to chance. Find a great room and request it from Disney. Why request a specific room from Disney? At Disney's All Star Sports Resort, it may mean the difference between Room 9106 (above), and Room 9306 (below) — just two floors above. Ready to start using our complete library of tools and resources?